Women are everywhere. Women are leaders, professionals, and trailblazers. Yet while much has changed in the workplace and in our culture, research reveals that unconscious gender norms are still deeply entrenched. The resulting gender inequity affects all of us as individuals and organizations. MSCI ESG Research has been reporting annually on the state of women’s representation on corporate boards of directors since 2014. The 2015 report includes relevant information such as the investment case to be made for gender equality on boards, and subsequent annual reports include additional pieces such as gender equity in CEO salaries. These links are for the 2015 study and 2018 progress report. This global survey of 21,980 firms from 91 countries suggests that women in corporate leadership might improve a firm’s performance. Diversity is key to business success and thus, companies with men and women in leadership roles are better prepared for all eventualities. This study examines how a lack of female leadership might have potential to place a company at more risk. This study provides an in-depth analysis of how business benefits from supporting employees’ transition to becoming parents. 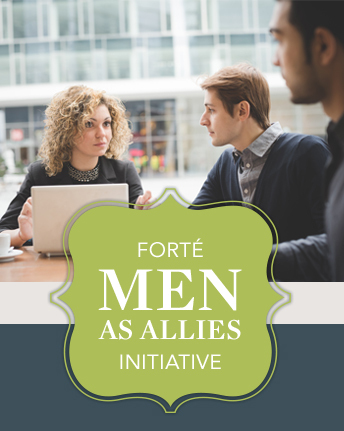 This multiyear study published by the Alliance for Board Diversity (ABD), in collaboration with Forté sponsor, Deloitte, for the 2016 and 2018 censuses, provides powerful metrics on the slow change of diversity in the boardroom, and may help encourage corporate boards to continue to embrace the benefits of diverse board composition. In its fourth year of ongoing research, this study conducted by Forté sponsor, McKinsey, in partnership with LeanIn.Org, reports on the progress, or more accurately the lack of progress, in women’s progress in corporate America. Numbers can only tell part of the story. This study mapped employee interaction to gauge the role of women at work from a different perspective. Does an MBA hold the key to helping women and minorities boost their earning power and increase equality in the workplace? Part one of a new research series from Forté reveals mixed results. The 50th anniversary of the admission of women to the Harvard Business School spurred research on the experiences of alumni from Baby Boomers to Millennials. The study explores the aspirations, professional satisfaction, and work-life integration of Harvard Business School graduates and finds gender playing a key role. Men who prioritize family face greater penalties than their female colleagues. What will help to eliminate—or at least minimize—this penalty? This report by the International Monetary Fund looks at the business case for women in the workforce, the drivers that influence women’s retention, and the role of policy in keeping women working. The report is focused on Europe. Worldwide comparisons through a gender gap index by country showcase how fundamental gender equity is to how societies thrive. Per capita GDP, global competitiveness, and human development metrics are tracked. This study tracks the gains and persistent gaps for women and girls worldwide. It highlights the positive multiplier effect—and the great opportunity—provided by investing in women and girls.